CLENDENIN, W.Va. – On Thursday, April 26, 2018 at 6:00 PM, the Clendenin Planning Commission, facilitated by WVU Law, hosted an open house immediately following their monthly meeting at the Clendenin Recreation building. 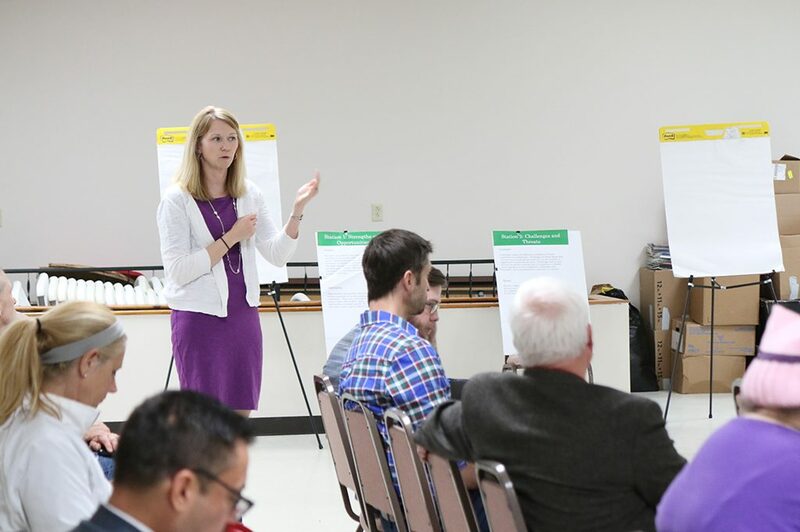 WVU Law’s Land Use and Sustainable Development Law Clinic, headed by Christy Burnside DeMuth, set up displays to obtain public input concerning the Comprehensive Plan for the Town of Clendenin that they have been working on over the past few months. According to DeMuth, they have completed similar Comprehensive Plans for various towns in West Virginia, including Fayetteville, Dunbar, Elkins, and others. 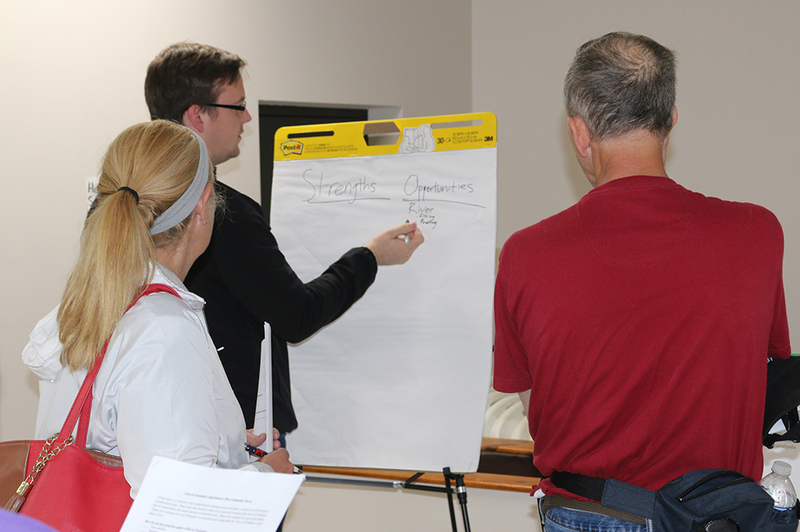 Attendees were encouraged to help identify strengths, opportunities, challenges, and threats. 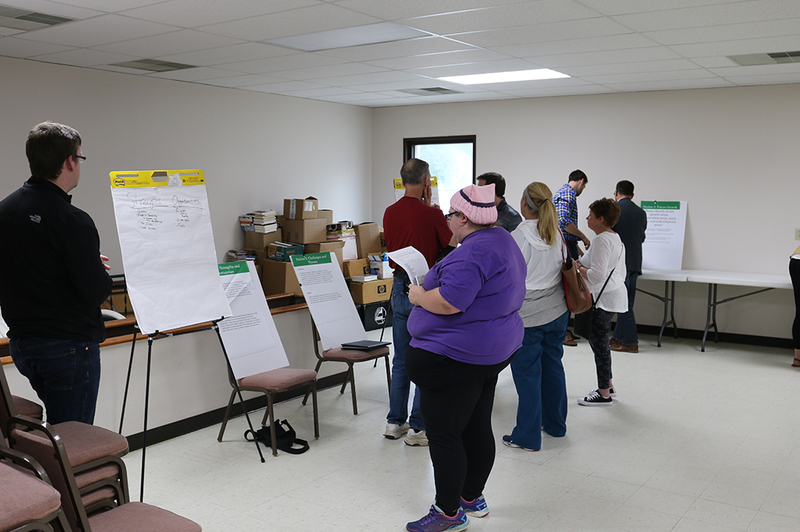 By the end of the evening the community had identified Clendenin’s strengths as: churches, people in the community, the clinic, local businesses, A Healthy Clendenin group, carnival, parks, and flat space for walking. Opportunities were identified as: the Elk River (fishing, boating), green space, trails, incorporate other areas, permanent library, complete The Roxy, grocery store, farmers market, create more sidewalks and crosswalks, grants, and KRT (Kanawha Valley Regional Transportation Authority) Sunday availability. Challenges identified by the community included: lack of activities for youth and seniors, lack of grocery store, empty buildings, devaluation of property, distance from amenities, dilapidated sidewalks and streets, and visual appearance of the town. Identified threats included: drugs, lack of youth activities, transient population, jobs, schools, squatters and thieves. 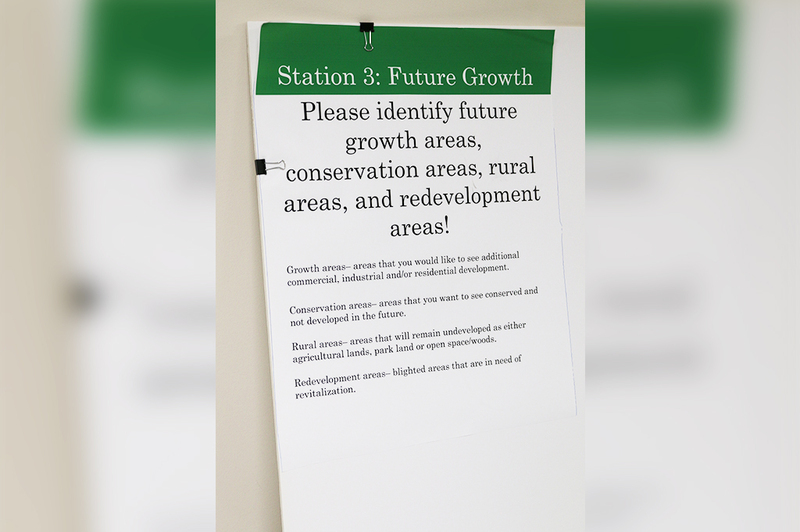 In addition, the public was asked to identify future growth areas, conservation areas, rural areas, and redevelopment areas by outlining recommendations on a map of Clendenin. 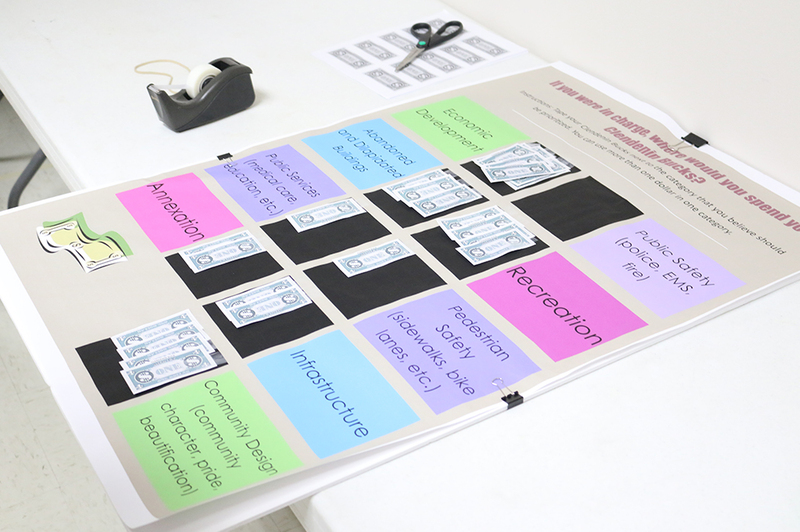 Attendees were also given five “Clendenin Bucks” and asked to place the play money on a board to represent where they each believed money needed to be spent in Clendenin. The top three areas included: Economic Development, Community Design (community character, pride, beautification) and Recreation. 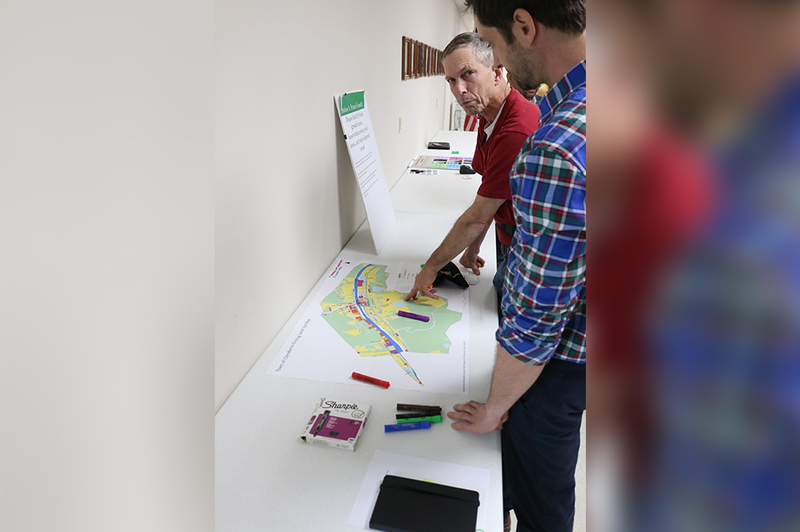 Reactions from attendees were mixed; however, there were many common opinions, including the need to improve the Town infrastructure, development of areas outside of the flood zone for housing and additional businesses, and the need for businesses to locate to Clendenin. 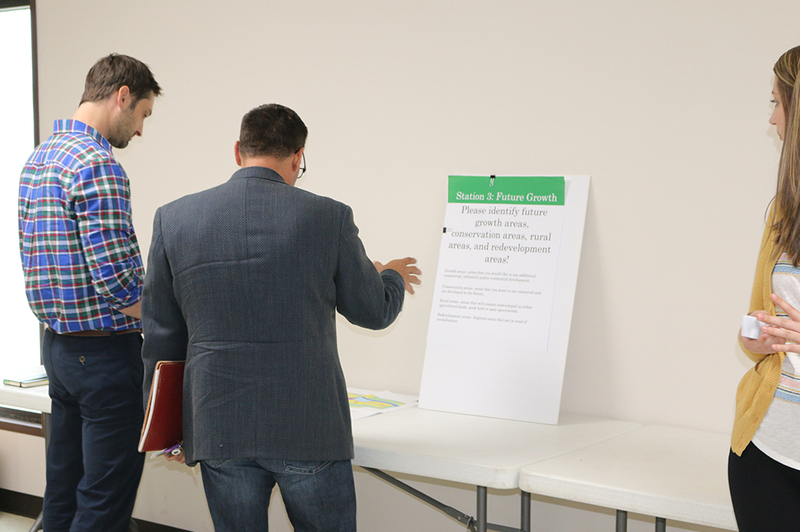 Everyone was in agreement that Clendenin needs a grocery store, but opinions were varied as to the other types of businesses that should locate to the area. Dean Jeffries (R), House of Delegates-40th District Candidate from Elkview, was impressed with and hopeful that the Comprehensive Plan would help bring funding to Clendenin. “There is so much potential here. It’s just waiting to happen, but the funding is just not here right now”. When asked about what he saw as the biggest potential in Clendenin right now, he stated “I think recreation is the biggest potential.” He mentioned the Elk River, the railroad with the Rails-to-Trails opportunities, and improving access to kayaking and additional restaurants. 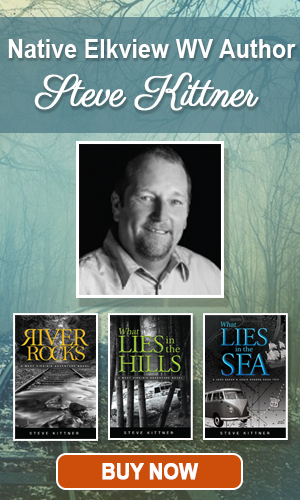 As Jeffries pointed out, “fishing is already great. The musky fishing in this area is some of the greatest in the state.” Jeffries echoed sentiments from previous Planning Commission meetings about Clendenin becoming similar to Fayetteville. 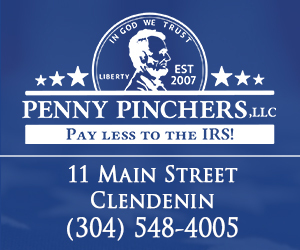 He further stated that Clendenin “is a prime area for small businesses and manufacturing”. Clendenin resident Kayla Reed has attended many of the Planning Commission meetings, as well as Town Council meetings and is actively involved with the Clendenin Homecoming Festival committee. Reed said that she was hopeful that the Comprehensive Plan would “help make Clendenin a better place”. 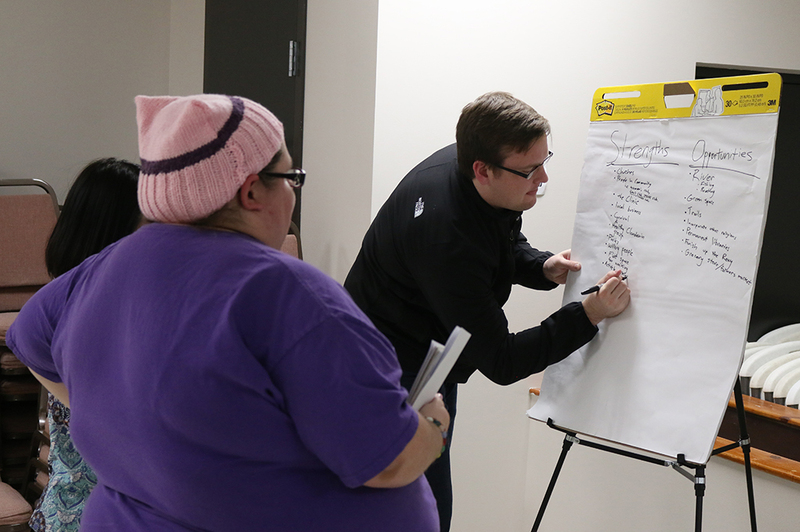 Kayla echoed the majority of attendees that adequate housing was needed in Clendenin, along with a local grocery store, while pointing out that she and others would enjoy a small coffee shop/book store, as well as a place to enjoy art. Janet Rollyson, another Clendenin resident, felt that there were good ideas being discussed by the Planning Commission. She expressed a desire to see all 2016 Flood victims recovered over the next few years. Rollyson continued by stating that she would like to see further utilization of Elk River, including creating a dock in town and steps to the river, as well as a bakery and grocery store that offered delivery services. Non-profit, A Healthy Clendenin member, Jessica Wright, explained how she would like to see Clendenin as a vibrant community that reflects the fellowship and pride of the people of Clendenin. 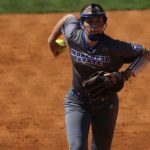 Wright said she would like to see fitness related businesses like bike shops, in addition to businesses to support recreational activities like hiking, canoeing, and fishing. 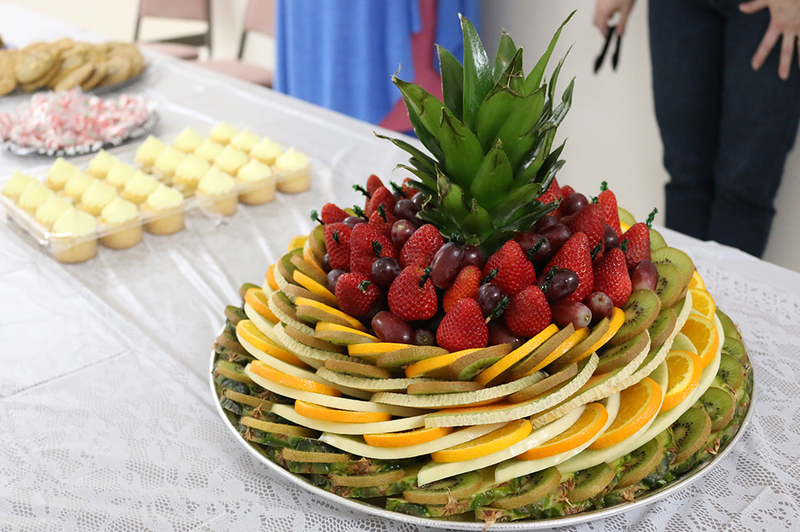 The open house was informative and welcoming of ideas from those in attendance. 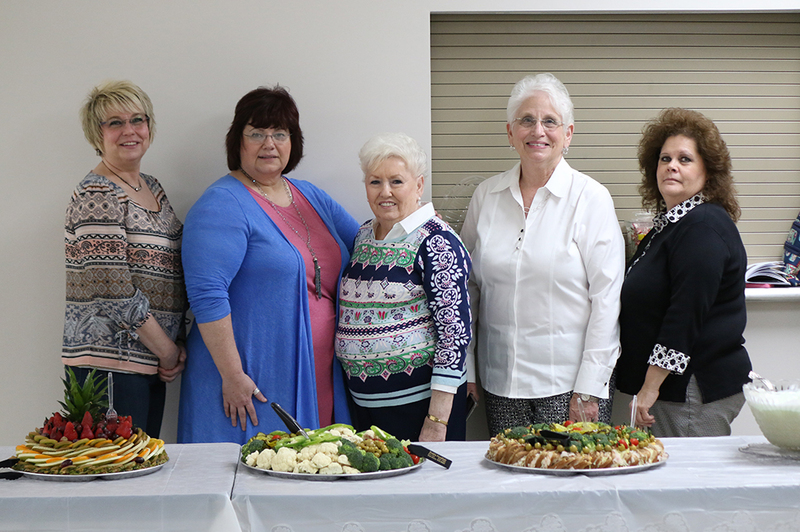 Food for the evening was sponsored by The Clendenin Women’s Club and included punch and various deli and fruit trays from Smith’s Foodfair in Elkview. 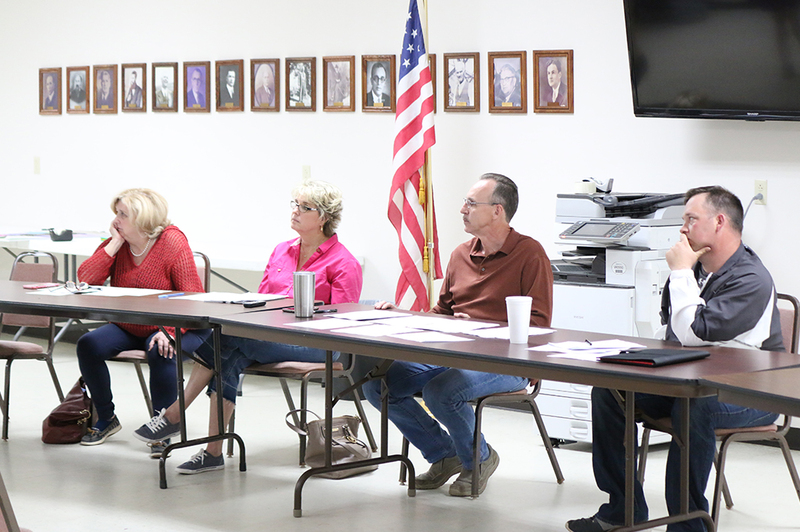 The Clendenin Planning Commission holds monthly meetings which are open to the public. Visit our Events page for dates for upcoming Planning Commission meetings. 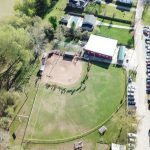 If you would like to participate in the Town of Clendenin Comprehensive Plan Survey to provide your input on what you would like to see changed in Clendenin and projects you want your tax dollars spent on, visit https://www.surveymonkey.com/r/ClendeninCompPlan, download survey or pick one up at Town Hall.